This was my second attempt at trying to score a table at the hugely popular Bao. Very rarely has a restaurant opened to universal praise and never ending queues so I had to go and see what the fuss was all about. Luckily on an atypical Friday evening there were only a few tables queuing before us, so repressing the impatient foodie in me we waited outside on a damp July evening. Bao has an exceedingly streamlined menu. It goes without saying that we ordered two of Bao’s eponymous dishes straight off the bat, The Classic; the one that started it all, and the Confit Pork. Both offered melt in the mouth pieces of pork, though in the confit pork’s case; maybe overdoing it, since I don’t even remember eating pork in that one! I preferred the Classic for its combination of flavours and ingredients, the nuttiness and the coriander proving good parings to the pork, each mouthful provided different flavours. On paper the confit pork was a match made in heaven for me but the scallions didn’t do enough to introduce the much needed texture into the Bao and the sauce was somewhat overpowering. So whilst moreish and succulent, it didn’t really excite. Onto the Xiao Chi or “small eats”, if you must. Guinea Fowl Chi Shiang Rice was a beautiful bowl of goodness. The tender guinea fowl adding substance to the dish. If you’re hungry this comes highly recommended as one of the more filling dishes. The yolk proved an ample sauce to marry together the ingredients creating one bowl of fluffy and rich rice. 40 Day Rump Cap, Aged White Soy Sauce was a delight, though I wish there was more! The cut of meat was flavoursome and had just the right amount of texture to give it substance, matched perfectly with the delicate white soy. I don’t know any cuisine that doesn’t like a piece of fried chicken. Whilst in the UK Taiwanese fried chicken might not be common it’s all over the shot in East Asia. Bao’s version is as good as those you find in Asia, with its light crispy skin wrapped around tender and juicy pieces of meat, though price wise it’s a bit of a stretch. London’s only scraping the surface with fried chicken “asian style” in its recent discovery of KFC. That’s Korean mind you, though I’m partial to the Kentucky kind myself as well! We were still craving more after our initial chomp through the menu so ploughed on with an extra order of Trotter Nuggets, Fried Chicken Bao and Sweet Potato Chips, Plum Pickle Salt. The trotter nuggets were surprisingly meek. Having seen photos of the filling beforehand I was expecting a piece of soft but slightly chewy ball of fried heaven dotted with gelatinous bits of meat. What I had was a crispy fried fritter wrapping around soft and gooey pieces of pork, mind you that is by no means a problem, they were rather tasty with the wasabi sauce on the side but expectations were high and unfortunately the nuggets came down a little as a disappointment. 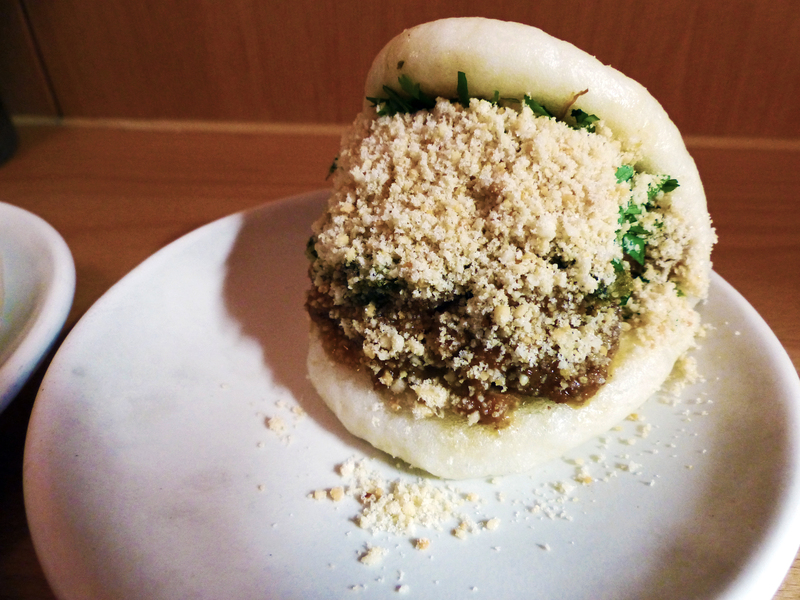 The Fried Chicken Bao takes on a different form compared to its companions, with a more traditional bun shape. Personally the change in bun didn’t yield much variation in terms of flavour, instead it was the punchy coriander that did the trick. However I do feel that the shine had slightly been taken away from the chicken. I cannot fathom how they managed to get such crunchy batter for the Sweet Potato Fritters, Plum Pickle Salt, I could have had a plateful of the light batter in all honesty but matched with the velvety sweet potato and the slight sourness of the sauce made this an enjoyable snack. We also scored a shot of Peanut Milk and BaoZhong Tea. The Peanut Milk comes recommended, a definite sweet peanutty treat. The Baozhong Tea was an interesting combination, I’m not quite sure it works but either way the tea is very refreshing and delicate. To wrap up proceedings we had the Fried Horlicks Ice Cream. The subtle taste of horlicks was definitely a welcome treat and the mildly sweet bun made this an unexpectedly indulgent treat but I kind of wish that the bun was crisper. The space was cramped but well laid out so that whilst it was a hole in the wall you don’t feel like everyone is on top of you. Service was friendly, inviting and efficient, which I imagine they have to be with so many little plates darting around. I must say though that I do find Bao a little overpriced, yes I said it! Despite nothing on the menu being over £6 portion sizes are deceptively small so over ordering is pretty easy. Bao just reopened their Netil Market stall so there’s another place to savour their buns and if sitting down in an actual bricks and mortar establishment is just not your thing! Telephone: They’d rather you not!